Jeep drivers are fluent in spare-tire language. They love to make unique statements and show their pride in their vehicle. But they also care about product quality, so most Jeep drivers we know will pass on a shoddy Jeep Wrangler wheel cover, no matter what it displays. 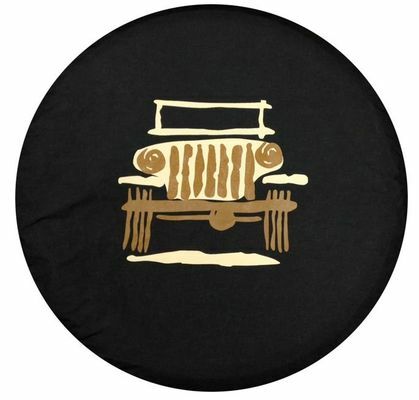 At Just for Jeeps, we work directly with OEM Mopar to offer only quality tire covers in a variety of designs. This whimsical cartoon Jeep takes the cake, with the way it stands out. Resembling an adorably animated sketch, this brown and gold design carries Jeep's unmistakable, instantly recognizable headlights and grille. The design may express a light-hearted spirit, but the cover is tough as nails. Made out of a black soft-top material, it will grip your spare like a vise and protect it from weather, debris and damage. Compatible for a wide range of Wrangler models, this cover makes a perfect upgrade for drivers who enjoy making others smile. We give Jeep drivers the best of both worlds with our tire covers - outstanding, eye-catching designs and rugged, Jeep-like toughness. I wasn�€™t real sure about the look of this when I got it, but my friends really liked it so I put it on. My Wangler is Granite Metalic and it matches nice! Glad I kept it! Its a simple tire cover, made of quality material & was easy to fit. I love this wheel cover. It completes my Jeep. It's not the typical cover and stands out. I've gotten quite a few looks and glad I picked this one.